The Mask and Wig Club of the University of Pennsylvania was started in 1888, by a small group of Penn undergraduates, led by Clayton Fotterall McMichael, who were interested in the stage. The group saw the theatre program at Penn lacking in many ways. McMichael and his cohorts wanted something the University did not offer: a troupe that would produce humorous theatrical pieces. 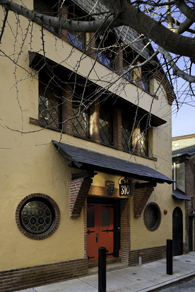 In 1894 the Club purchased a property at 310 South Quince Street to serve as a gathering place and rehearsal hall. Prominent Philadelphia architect Wilson Eyre was commissioned to convert the building, which had previously served as a church, a dissecting room, and a stable. He hired the young Maxfield Parrish, who would later become one of the greatest illustrators of the twentieth century, to decorate the interior. The Grille Room was decorated with caricatures of members; a tradition that continues today, with the second century of members’ caricatures continued upstairs at the entrance to the theater. The Club prospered throughout the late 19th and early 20th centuries. The 1950’s were a heady time for the Club. Mask and Wig songs were the rage of the big band orchestras, radio shows, and solo acts of the day. The likes of Frank Sinatra, Glenn Miller,Tommy Dorsey, Benny Goodman, Count Basie, Rosemary Clooney, and Les Brown all covered Mask and Wig tunes. The 1961 production, Wry on the Rocks, introduced a satirical revue format in a cabaret atmosphere. In 1992, with Myth America, Mask and Wig returned the student–written book musical to its stage, a practice which continued last year with Troy Story. Important in the show’s success are the traditional high standards in the caliber of performers and excellence of the material performed.